In South Windsor CT and all of Hartford County Connecticut, Northeastern chimney provides a variety of chimney sweep services such as chimney repair, chimney cleaning, chimney inspection, chimney liner installation, masonry repair & tuckpointing, and chimney restoration & rebuilding. All of our professional chimney techs are CSIA certified and trained and every job is completed to the highest of standards, which is why we have thousands of satisfied customers in the great Hartford area. Residents have come to trust us to perform every chimney service, repair, or rebuild to the highest of industry standards. We stand behind our work and have a 100% satisfaction guarantee which is why customers return to us year after year to complete their annual fireplace, stove, and chimney maintenance. We belong to the National Chimney Sweep Guild which helps us stay current on all the best practices, new products, and safety procedures in the industry. Staying up-to-date with the changes in the hearth industry is just another reason we have become the best chimney contractor in the South Windsor Ct area. From Main Street to Rt 5 and I-291, residents can spot our brightly-marked company vehicles as they travel through South Windsor CT on their way to deliver top notch chimney sweep services & maintenance. From chimney crown rebuilding to chimney relining, fireplace & stove service, and annual inspections, our professional crew has been serving South Windsor, Bristol CT, Granby CT, Farmingotn CT, Avon CT, and the surrounding area for over 30 years. We have built a strong reputation for delivering dependable service & outstanding workmanship which has helped us to become the local chimney sweep of choice. Just ask your friends and neighbors why they trust us for all of their chimney & fireplace maintenance needs. Don’t fall for a common chimney sweep scam! There are fake “chimney sweep contractors” flooding the industry, promising homeowners low prices for common chimney sweep services like inspections or cleanings. While it may seem like a good deal, think twice before hiring a “cheap sweep”. Not only are these companies usually uninsured, they often don’t have certified technicians that are capable of properly handling your chimney or venting system. Their main goal is to simply upsell the homeowner into expensive repairs or services. Before agreeing to any extensive chimney repairs, contact a reputable chimney sweep contractor for a second opinion first! 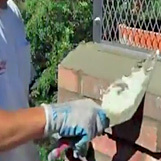 Many times, these repairs are neither warranted nor necessary, but the scammers know that homeowners are usually unaware of the current condition of their chimney, so they use that to their advantage. There are many ways to take advantage of unknowing homeowners, so please take care when hiring a chimney company. It’s best to ask for references and check their credentials before contracting any chimney sweep. Trust in the professionals at Northeastern Chimney, Inc. for all chimney, venting, fireplace, insert, and stove service. Top Chimney Sweep company in the South Windsor CT & Hartford County area offering the service you deserve.